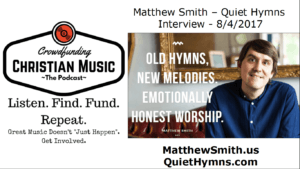 Crowdfunding Christian Music - The Podcast • A blog and podcast exploring current and past crowdfunding campaigns for Christian music. In episode 66 we look at some current campaigns by Brock’s Folly, Tommie Billups, Bethany Barnard, Maria Roate, Mark J the Poet, Mavis Pan, Michael Anderson, Broken Records Reunion, and Demon Hunter, and Under the Radar. Think of me as both your tour guide and filter – working to connect artists with fans and fans with artists and highlighting some excellent campaigns worth backing. I hope you enjoy the show and find something you can get behind and support. In episode 65 we look at some current campaigns by Audrey Assad, Sandra McCracken, Merci Neff, The Sweet Sorrows, Common Courier, Least of These, Chris Taylor, Paper Route, and Spaceships. Think of me as both your tour guide and filter – working to connect artists with fans and fans with artists and highlighting some excellent campaigns worth backing. I hope you enjoy the show and find something you can get behind and support. In episode 63 we look at some current campaigns by Joshua Leventhal, Random Hero, Edward + Jane, The Fast Feeling, and a GoFundMe for Tom Gulotta. Think of me as both your tour guide and filter – working to connect artists with fans and fans with artists and highlighting some excellent campaigns worth backing. I hope you enjoy the show and find something you can get behind and support.